The Labor Department reported on Friday that U.S. monthly unemployment rate hit 7.6% in January, the highest level since September 1992. The unemployment rate in December 2008 was 7.2%. In January, employers cut a total 598,000 jobs, the most monthly job losses in more than 34 years. Both the number of job losses and unemployment rate are higher than economists have expected. 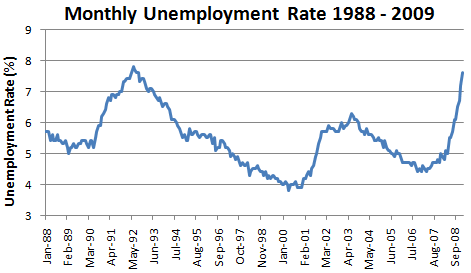 The unemployment data highlights the deterioration of the labor market. According to the Labor Department report, the number of unemployed person in the country has increased to 11.6 million. Since the recession started in December 2007, 3.6 million have lost their jobs. About half of the job losses occurred in the past three months. In this enovirnment, you are lucky to have a job.